As the calendar moves deeper into fall and winter, the days get shorter and sunlight becomes more precious. Instead of sitting on your balcony until late in the evening, you're ready for bed by 8 p.m.
Don't resign yourself to months of shadows and gloom. 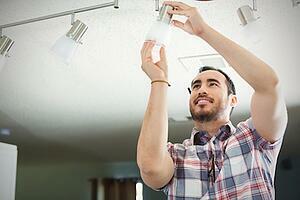 Use these tips to keep the light flowing through your Springs luxury apartment home. Anything that obstructs a window, no matter how small, reduces the amount of light that passes through. Make sure your windows are completely visible, top to bottom and side to side. Mirrors don't reflect vampires because they reject darkness and seek light. Hang a mirror across from a window and just watch the rays of light bounce around the room. The newer LED and CFL light bulbs use less energy and last longer than traditional incandescent bulbs. Enjoy a well-lit apartment without burdening your conscience or your budget. Lampshades are functional as well as decorative. They control the amount of light that passes through from the lamp's bulb. Look for lampshades that are lighter-colored and more translucent, or consider simply removing them altogether. Interior decorators recommend a minimum of three different light sources to fill out a room. Use a well-rounded mix of sources, including overhead lights, floor and table lamps, and candles. Our Springs luxury apartment homes feature faux-wood blinds that are perfect for allowing plenty of natural light while still providing privacy. If you like the look of curtains or drapes, choose ones made with lighter fabrics and colors. There's a reason why we wear dark colors in the winter and light colors in the summer. Darker shades absorb heat and light, while lighter shades reflect them. Use the same principles with home furnishings and accessories. Add dedicated lighting sources that provide focus for specific tasks, such as cooking or writing. Gooseneck and adjustable lamps are good choices, as well as puck lights that fit under cabinets and other difficult spaces. String lights aren't just for holidays and parties. They provide beautiful ambient light along with a charming decorative accent. What's your favorite gloomy day pick-me-up? Tell us in the comments!